Join us at The Workshop Dubai for a showcase of Fadwa Al Qasem's work, and a conversation with the host Diala Arslan Talhouk, on 11 February, at 11am and 7pm. 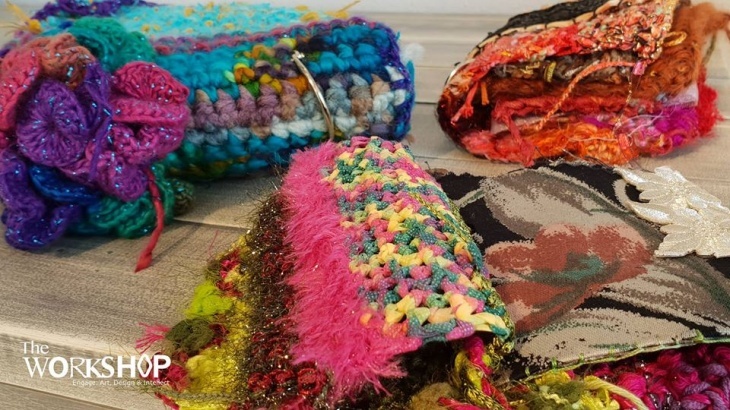 Since the language of touch is much louder than that of words, Fadwa's fiber-art journals are works of interactive fine art that, unlike most art pieces, demand to be touched. These fiber-art journals were born of the artist's love for journals and journeys - both words derived from the French word "jour" meaning day - a diary, a daily practice, a distance that can be traveled within a single day. All echoing the artist's belief that we can achieve a great deal, one thing at time and many things over time. Incremental changes add up. The fiber-art journals were also born from her love for stories and humanity's urge for mark-making since the dawn of time. Each piece is handmade by the artist. The yarns are knitted, crocheted, looped, manipulated and curved, as if echoing secret and forgotten scripts. The absence of words is at times more powerful than their presence. These are silent journals which you can read by touch, like Braille, but not quite, because they will say different things to different people. And the colors will also draw you into their realm. The event will showcase Fadwa's Fibre-art Journals, and consist of a talk between the artist and Diala Arslan Talhouk, the host for the evening. Fadwa Al Qasem considers herself a woman with a restless soul and a gypsy’s spirit whose art is a response to the smallest details of the human condition as experienced in her own inner world and the outer, greater world. The constant tension between guilt and the search for joy keeps her raw and honest in her work, and she jealously guards the rough-around-the-edges aspects of her art. As a mixed media artist, Fadwa focuses on emotion, experimentation, and exploration. Her work seeks to discover new harmonies between techniques and materials. She finds creative energy in lines, patterns, curves, abstracts, color and texture. This takes her art into various directions; mixing fiber-art with acrylics, mixed media collage, imaginary portraits and nudes, and art journaling. Fadwa believes art requires you to engage your full being - mind, spirit and body, towards an existence that is interesting, encompassing, compassionate, beautiful and thus more bearable. Art is not separate from life and what you create in life is who you are. This led to the creation of her artist manifesto I Am What I Art. And yet, she believes, once art is created and delivered into the world, it no longer belongs to the artist and so the artist is no longer the one who should be interpreting it. UK, and is currently studying Art Therapy. She is also a poet and a published bilingual author with three short story collections in Arabic and one in English, and her short stories and poems have been published in various literary magazines in the Middle East, UK and USA. She is currently working on her first novel. Diala Arslan Talhouk was born into a leading political Lebanese family in 1971. She was 3 years old when civil war broke out in Lebanon. Her childhood & adolescence were marked with its atrocities. Her parents would help ravaged families, often putting themselves at risk to save others from kidnap, assassination & murder. A Queen’s Tale (2004) is a story of worker bees who overthrow their authoritarian queen; Diary Of An Ant (2005) stresses the importance of the environment in a human being’s life; The Adventures Of Aziz (2006) tell the adventures of a rowdy boy of 8 who learns lessons from his mistakes. When children began to turn more and more into electronics and away from printed books, Talhouk turned one of her stories into a game that kids could download on tablets. The game is called Mythcovery Phoenicia (2016), where players follow clues spread all over ancient Phoenician city-states to uncover their mythologies, all the while listening to mini-stories of the said city-states and their heroes.